There are 28 different species of bats in Arizona. Most of Arizona bat species are insectivores (insect eaters) but two of Arizona’s bat species are nectarivores (flower nectar drinkers) the lesser long-nosed bat and the Mexican long-tongued bat. Nectarivorous bats can be identified from by their larger eyes, smaller ears, and long tongues. 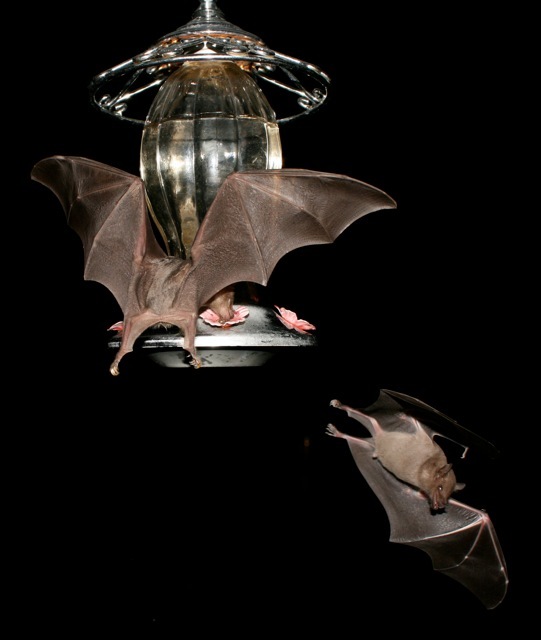 They normally nectar bats feed on night blooming and fruiting plants such as saguaro and organ pipe cactus and agave. The agave plant and the saguaro cactus depend upon bats for pollination and seed dispersal. Nectar feeding bats are amazing long-distance fliers that migrate long distances to follow the blooming seasons of their favored plants. Late summer into fall in southeastern Arizona hummingbird feeders may be visited during the night by nectar-drinking bats that cross over into the U.S. from Mexico by late fall they have migrated back to Mexico. Each year we monitor our feeders and enter the data into the Lesser Long-nosed Bat and Hummingbird Feeder Project website, http://marana.com/index.aspx?NID=520 Data collected from this study will be used by scientists to better understand the lesser long-nosed bat, a species listed as endangered under the federal Endangered Species Act. The hummingbird feeder project has been going on in the Tucson Basin since 2006. Our first bats this year were seen on Aug 11 at around 9pm. The feeder level had dropped about an inch by morning. If this year goes like years past, in a week or so they will be draining the feeders by morning. ~ by Meg on August 12, 2012.